"Manchester City have scored at least four goals in a game an incredible 12 times this season, they put seven past Stoke in their last meeting, and they've won two of their last three trips to the bet365 Stadium by a scoreline of 1-4." Stoke conclude this week's Premier League fixtures having received a minor boost over the weekend thanks to defeats for West Brom, Crystal Palace, Southampton, and West Ham. It means that a win on Monday night for Paul Lambert's men will move them out of the relegation zone and to within a point of Swansea who occupy 14th position in the table. That's the good news. The bad news is that visiting the bet365 Stadium on Monday evening is champions elect Manchester City. The Potters suffered their biggest defeat of the season in the reverse of this fixture, going down 7-2 at the Etihad Stadium in October, and since that loss they've won jus four of their 22 games played, those victories coming away at Watford, and home to Swansea, West Brom, and Huddersfield. Lambert's men have lost their last six Premier League games against clubs currently sitting fifth or higher in the table, scoring just three goals in those matches and conceding an alarming 27. It's been a question of when, and not if, Man City win the title seemingly for three or four months now, they've been that dominant in this season's Premier League. 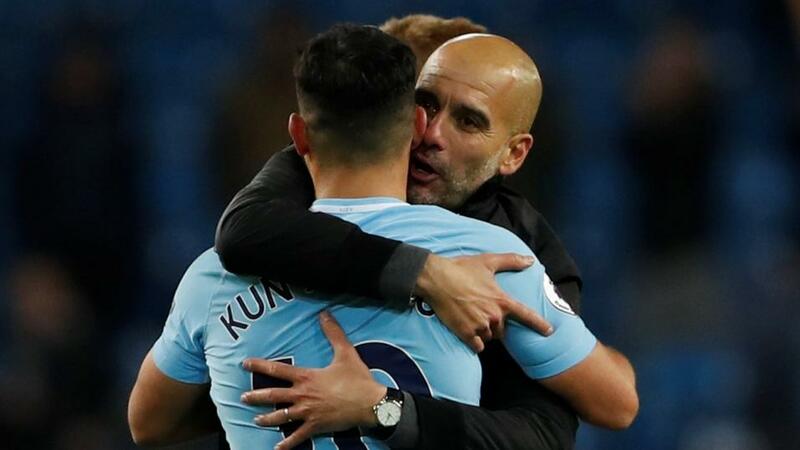 Four more wins from their last nine fixture will see Pep Guardiola's men crowned champions but should the Citizens when their next two games - against Stoke on Monday night and Everton after the international break - then victory over Manchester rivals United at the beginning of April will be all that is required to seal the deal. You just know that Guardiola will have that game firmly earmarked as the one when he wants to put the title to bed. April 7 is the date for your diary. City go into this match following a home defeat to Basel in the Champions League, but that game is easily ignored given it was virtually a second-string side against a team they were already leading 4-0. Prior to that defeat Guardiola's men had won three on the spin against Arsenal (twice) and Chelsea without conceding a single goal. And it's probably not too much a stretch of the imagination to suggest they probably didn't concede possession either! With City not playing again until March 31 following this trip to the Potteries it's almost certain that we'll see Guardiola name a full strength side to face Stoke. There isn't any logical reason to oppose Man City in the Match Odds market, they are head and shoulders above their Monday night opponents, have plenty of incentive to win and edge a little closer to securing the title, and they practically have a fully fit squad to choose from. Consider also Stoke's dreadful recent record against the big boys, and the fact that they've conceded an average of 4.5 goals per game in their last six such matches, then it's impossible not to suggest an away win, even at odds of [1.25]. That's not a price we like to recommend here however, so given we can't make a case for the shock home win at [15.5], or even the Draw at [7.0], then let's move on. I tried desperately hard to make a case for Stoke hanging on until the interval, but I can't, even though they've only trailed after the first 45 minutes once in thier last six matches. But Man City are a completely different animal to any of Stoke's opponents in those six games. Guardiola has also spoke about securing the title as quicly as possible, saying "It's almost done. But we are not the champions. The champions are still Chelsea. We have to get the points as soon as possible, knowing that we have the opportunity." That suggests to me that the Citizens will be completely up for this game. Since Man City lost for the first time this season at Liverpool they've won nine games in all competitions, scoring first half goals in all but one of them, and scoring 13 times inside 45 minutes in those matches. Again, I keep going back to Stoke's dreadful recent record against the big clubs and if they are going to lose this game by two or three, possibly more, then it's likely that Guardiola's men will score early. We can back Man City HT/Man City FT at aronnd the [1.76] mark. Manchester City have scored at least four goals in a game an incredible 12 times this season, they put seven past Stoke in their last meeting, and they've won two of their last three trips to the bet365 Stadium by a scoreline of 1-4. Consider also that Stoke this season, as well as conceding seven at the Etihad, conceded four at home to Chelsea, five at Stamford Bridge, five away to Tottenham, three at home to Liverpool and even three at home to West Ham, then the best bet of the game may well be Man City to win by scoring at least four goals in the process.